In 1913, nearly 30,000 Americans were dying each year from typhoid fever—most as a consequence of drinking contaminated water. Within a decade, the death rate from typhoid was only 2,000 a year, a 93% reduction. Hundreds of thousands of lives were saved thanks to Charles F. Wallace, the inventor of an automatic chlorinating device used by municipal utilities to purify water. Wallace was born in Illinois and moved frequently throughout his childhood due to his father’s service as a colonel in the Army. As an adult he planted roots in New Jersey. In 1911, Wallace and his life-long friend and business partner, Martin F. Tiernan, founded Wallace & Tiernan Company in Belleville, New Jersey. The two young men—not yet 30 years old—used their combined savings of $1,800 to set up a machine shop in which Wallace constructed equipment that Tiernan would sell. They broke new ground in 1913 by developing a machine that would automatically pipe chlorine gas into a Boonton, New Jersey stream that was polluting the Jersey City water supply. Wallace's first invention was so successful that within a few years the Wallace & Tiernan device was being used to purify half the world's drinking water supply. In addition to the chlorinator, Wallace invented pressure-sensitive instruments and telemetering systems as well as timing devices used in marine beacons, foghorns, and other aids to navigation. He also developed a process widely used in the baking industry for bleaching and aging flour. In all, Charles Wallace was granted more than 80 patents during his career. In 1914, Wallace married Florence Murray. Murray was born in Rochester, New York and raised with Quaker values. She was a teacher in her early adult life and was active with local social issues and community wellbeing. The two lived together in Westfield, New Jersey, for 50 years raising a family of three daughters: Jane Wallace Thorne, Barbara Wallace Cornwall, and Elizabeth Wallace Sharts. In 1933, the Wallaces created The Eljabar Foundation as a mechanism for returning to those in need some of the rewards of a successful business career. The formation of the Florence Murray Wallace Fund in 1958 was an attempt to conserve dollars for true philanthropic work. The daughters were the nominal founders and managers of the trust that was to become The Fund for New Jersey. Still Charles Wallace continued his commitment, heavily funding the foundation from the start. In one year, he gave 50,000 shares of company stock to the trust, which was worth more than his annual income at the time. One principle that Mr. Wallace had was that it was more meaningful to make several large gifts rather than many small ones. New Jersey seemed to be a manageable geographic area to make such gifts. At the time The Fund for New Jersey was first organized, there was great need for giving in New Jersey. The Fund's focus on New Jersey was, therefore, an outgrowth of the community giving pattern started by the Wallaces in Westfield. Charles Wallace believed that only those living can understand and appreciate the needs of the time. So he left the future philanthropic decisions of the trust to future generations. 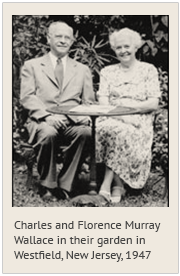 Since then, The Fund has shifted from community giving to supporting agencies of social change, policy analysis, and research, continuing the combined legacy of Charles Wallace’s innovative ability to solve large problems with Florence Murray’s dedication to promoting social good. This foundation has provided the flexibility that allows Trustees of The Fund for New Jersey today to make grants directly addressing the state’s most pressing issues.